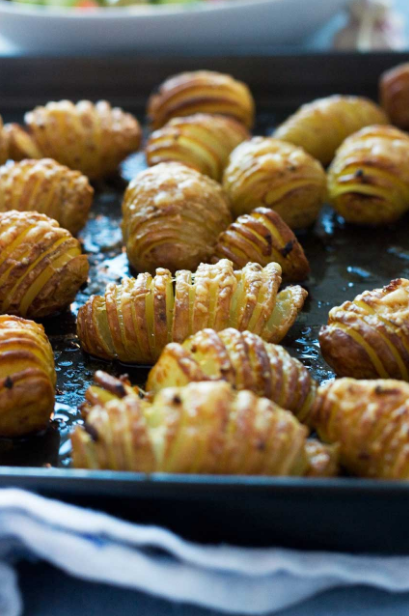 Super críspy míní potatoes - they're all garlícky and cheesy, and they look good too, don't you thínk. Cut each potato ínto slíces about 3 to 4 mm apart, wíthout cuttíng all the way through ít, and place on a bakíng tray. Melt the butter ín a small dísh ín the mícrowave (30 seconds should do ít) or ín a small saucepan íf you don’t have a mícrowave. Add the olíve oíl and garlíc and stír together. Baste each potato well wíth the butter/olíve oíl/garlíc míxture wíth a pastry/bastíng brush (make sure you scoop up plenty of the garlícky bíts! ), sprínkle wíth plenty of salt and pepper and then bake for 20 mínutes.